There’s something so simpatico about a sushi restaurant in a place known for its fresh catch like Santa Cruz, CA. 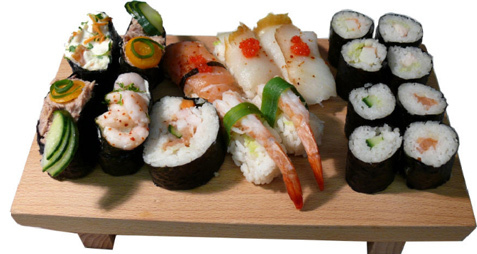 After all, the freshest sushi is characterized by crazy creative rolls with fish caught from the sea that very day. This is why the Santa Cruz sushi restaurants always stay busy as regular patrons and visitors enjoy the unique rolls created by sushi chefs situated in this slice of heaven along the California coast. For example, Mobo sushi bills itself as a “mind-blowing” sushi establishment that offers a slew of eclectic rolls, including the Nor-Cal, which is a roll with popcorn shrimp and tobiko, smothered in sweet sauce and the Eliminator, which is unagi with Macadamia nuts, cilantro and cucumber with spicy sesame sauce atop it. The sushi chefs are lively and entertaining and often turn the process of creation and dressing each roll into a full-fledged production, for those that enjoy watching their sushi rolls come to life. Naka sushi restaurant, which is located on 41st Ave., offers some of the best raw fish sushi in the region. It is known for serving hefty portions of fresh catch and makes a mean Octopus Salad. The ambiance of this Santa Cruz restaurant is dark and mysterious, making this is a great place to take a date and the crowd is always fairly diverse and full of true blue sushi lovers. Takara Japanese Restaurant is another Santa Cruz sushi joint that is downright one of the prettiest restaurants in Santa Cruz, with its stunning wood booths and Japanese décor. The rolls here aren’t super complex, which makes this a perfect spot for the beginning sushi eater. From a sweet shrimp roll to a scallop roll, complexity doesn’t take away from the sheer number of offerings in terms of rolls and cuts of sushi. Becoming tired of sushi, feel free to try something else. When we stick to Asian scene of Santa Cruz, you can visit some of the city´s Chinese restaurants. Other options offered by the city include also Italian or American dining alternatives.